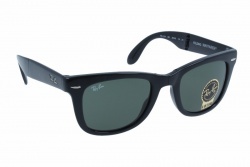 Ray-Ban Wayfarer Folding collection brings us the original design from Wayfarer collection, the best-selling design and the most imitated in the history of sunglasses as well as fashion icon, but now presented with a temple and bridge folding system that makes it possible to keep them in a smaller case. 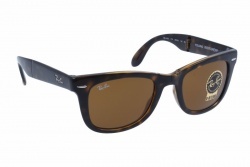 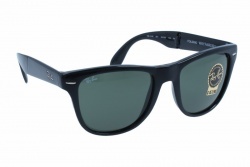 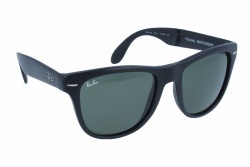 Ray-Ban Wayfarer Folding Classic sunglasses maintain the original model’s design line, but they’ve been modified and constructed into a compact, folding style that makes them portable. Thanks to special hinges assembled in the middle of their temples and bridge, these glasses can be easily folded and tucked away, taking up a very small space. 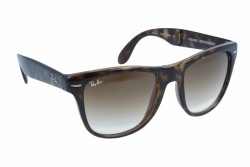 This compact, practical and portable design provides Ray-Ban’s unmistakable style of an authentic icon with Original Wayferer’s unconventional spirit, reinterpreted into new functional sunglasses. 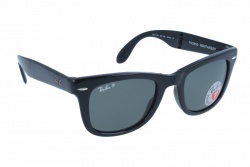 Besides Ray-Ban Folding Wayfarer (4105) sunglasses preserve shape and style of the original model but they are slightly larger, and like the New Wayfarers, they feature a straight design, getting rid of some of the edge and angles that made the Original Wayfarers so iconic.